The all-new Subaru Levorg will go on sale in the UK at the end of next month priced at £27,495 (on-the-road), Subaru has announced. The new sport tourer model, which made its European debut at the 2015 Geneva Motor Show, has previously launched in Japan, Subaru’s domestic market, where it has proved popular with existing customers and created many new converts to the brand. A spiritual successor to the much loved fourth-generation Subaru Legacy Tourer (2003-2008), the Levorg promises a compact on-road footprint yet greater interior space than its forebear. The car will be available in a single trim level called GT, with generous levels of standard equipment, including Subaru’s iconic All-Wheel Drive (AWD) drivetrain. 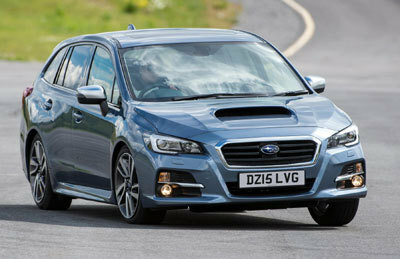 Subaru engineers and designers promise that the Levorg will offer one of the company’s most refined cabins created, with a greater use of high quality materials. Leather-trimmed sports seats with unique to Levorg blue stitching will come as standard, as will Subaru’s new factory-fit 7.0-inch touchscreen infotainment, connectivity and navigation system. Leather trim is used generously within the cabin, including the door trims, on the centre console and on top of the multi-function display on the dashboard. While the Levorg benefits from smaller exterior dimensions than the fourth-generation Legacy Tourer, the new sport tourer offers buyers greater practicality. Not only do occupants enjoy greater leg, head- and shoulder-room than in the last Legacy Tourer, but the capacious 522-litre boot – rising to 1,446 litres with the second row of seats folded down – provides ample room for anything from sports equipment and bicycles to luggage and pets. The Levorg has been developed with ease-of-use and practicality in mind, and owners are unlikely to find themselves short on space, in spite of the car’s compact footprint. When it goes on sale in the UK, the Levorg will be available with one engine: a newly-developed 1.6-litre DIT (Direct Injection Turbo) Boxer petrol engine, a signature format for the Japanese manufacturer. Paired with Subaru’s super-smooth Lineartronic (CVT) transmission, the Levorg will offer buyers a supremely refined powertrain. The new 1.6-litre DIT power unit offers the same performance as Subaru’s existing 2.5-litre naturally-aspirated Boxer engine, despite being 36% smaller. Engineered specifically for its application in the Levorg, the all-new four-cylinder engine produces 170 PS and 250 Nm torque. The all-new four-cylinder engine offers smooth, seamless power delivery and greater efficiency than existing Subaru engines. Flexibility is core to its character, providing power over a wide range of engine speeds and perfectly matching the car’s remit as a sport tourer. The Levorg accelerates from 0 to 62 mph in 8.9 seconds, while returning nearly 40mpg on a combined cycle. Emissions are rated at 164 g/km. With Subaru’s famous Symmetrical All-Wheel Drive system, Vehicle Dynamics Control and torque vectoring, the Levorg’s drivetrain provides unrivalled stability in all conditions. The new Levorg will continue to uphold Subaru’s reputation as a manufacturer of some of the safest cars on the road, with a strong, light bodyshell and a wide range of passive and active safety technologies. The new model boasts a higher proportion of ultra-high tensile steel than other models in the Subaru range, such as the Impreza, with 50% of the body made up of strong, yet light steel alloys for the greatest possible crash safety performance. The Levorg is equipped as standard with the new ‘Subaru Rear Vehicle Detection’ system (SRVD), which alerts drivers to vehicles which are crossing behind. A comprehensive safety package, SRVD combines three technologies: Blind Spot Detection, which alerts drivers to cars sitting in their blind spot; Lane Change Assist, which warns drivers of fast-approaching vehicles behind when the driver indicates to change lane; and Rear Cross Traffic Alert, which detects vehicles passing behind when reversing out of a parking space. Levorg also features SI Drive (Subaru Intelligent Drive) which allows the driver, via a switch on the steering wheel to chose between two modes according to their mood or the driving environment - Intelligent mode and Sport mode. To ensure best-in-class on-road handling, the Levorg joins the WRX STI and new Outback in being fitted with Active Torque Vectoring (ATV). ATV effectively brakes the inside wheels under cornering and apportions greater torque to the outside of the car, reducing understeer and oversteer to allow a more predictable and controlled course through corners. With a range of safety assist technology, as well as front, front side, curtain and driver knee airbags, whiplash-reducing front seats, and High Beam Assist, the Levorg is expected to receive a five-star Euro NCAP safety rating when it is tested later this year.